You think you are safe if you follow your doctors orders but are you? There seems to be a large growing problem with prescription medicine abuse that seems to have the policy holders in the U.S. concerned at this time. Since the 1990's prescriptions for narcotics has increased 300% in the U.S. 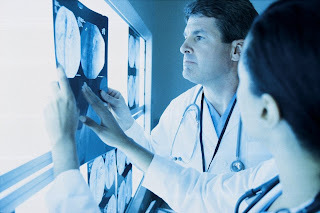 In the U.S. the second leading reason to see a physician is musculoskeletal problems. Most of the treatment of these ailments is with prescription medication and according to the Centers for Disease Control the most frequently prescribed opiate (a narcotic) is Vicodin. Vicodin is hydrocodone with Tylenol added to it. Tylenol increases the effectiveness of hydrocodone. There are approximately 139 million prescription written for Vicodin every year. In the year 2008 about 36,000 in the U.S. died from prescription drug overdose, which has TRIPLED since 1990. It is estimated, according to the CDC, that 4.6 million Americans are addicted or abuse this prescription drug. Also those on Medicaid and those living in rural areas (like Lampasas) are more likely to be addicted to this medication. Most of the current research involving lower back pain states that the use of these powerful narcotics does not help the patient get better any quicker. Another powerful narcotic is Oxycondone. In the U.S. it is prescribed for moderate to severe pain. 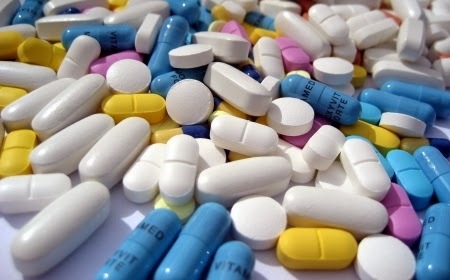 The international Narcotics Control Board states that in 1998 11.5 tons of Oxycondone were produced worldwide. In 2009 about 135.9 tons of this medication were produced world wide and the United States accounted for 82% of the world wide consumption. This medication is a very strong narcotic that has had a problem of abuse and illegal use in the U.S. So why would a chiropractor care about this? In the U.S. back pain is the second leading reason to see a physician today (right behind upper respiratory infections). So a lot of these powerful medications are being prescribed for back pain. The problems is all of the current research into treatment of back pain has stated that these medications do very little to help a patient get over a bout of back pain, yet they seem to be prescribed more and more each and everyday. This summer the Journal of the American Medical Association Internal Medicine published a study with showed that medical doctors are ignoring published guidelines for the treatment of back pain. Research has demonstrated that NSAID (Tylenol, ibuprofen, aspirin), spinal manipulation, and exercise are the best treatments for this condition. Powerful narcotics have shown to provide little to no benefit for back pain, but prescriptions are up 51% for these medications. The authors of the study have "significant concerns" that this maybe leading the crisis of increased deaths due to prescription medication. Do yourself a favor. If you or someone you know is suffering from lower back pain and they are on these prescription medications, show them this blog, and have them call our office to schedule an appointment so that we can help them get rid of their pain safely and effectively. Many patients have asked what exercises do I need to do to keep my back pain from returning? Current research indicates that lower back pain has a very high rate of reoccurrence about 60-80% within a two year period. Doing daily core exercises can lower this rate to under 30%. Remember I suffered from a ruptured disc in 2009 and have been doing some daily stretches/exercise since. I do them in the morning and they take about 10-15 minutes to do so they do not take very long. So if you are in acute pain something that you can do is the knees to the chest stretch which is demonstrated above. Pulling your knees to your chest will take tension off of the sciatic nerve and this may give some people relief. Some people find that knees to the chest is to uncomfortable so they need to try this back extension stretch. Try to hold for 10-15 seconds and then relax. Repeat this several times and then several times during the day. When not in acute pain you can try some "core" exercises. I like using the exercise ball because in my personal research I have found that the "balancing" type of exercises seems to strengthen smaller muscles in-between the vertebrae. So I start out on a ball doing the dog pointer. That would be laying on your stomach with the ball underneath and lifting your left arm and right leg off and holding that position for 15-30 seconds and then do the other arm and leg. Another one is to lie on your back and put the ball under your heels and straighten the back and hold for 30 or more seconds.
. One of the last ball exercises that I do it to lie on my back on the ball with knees bent. Then straighten one leg at a time holding for 15-30 seconds and then do the other leg. I then do two more exercises without the ball. The first is called a plank. You get on your elbows and on your toes and hold your body straight in that position for 30-60 seconds. This one, for me, is one of the harder ones to do. I had to build up to this exercise because at first it did bother my back. 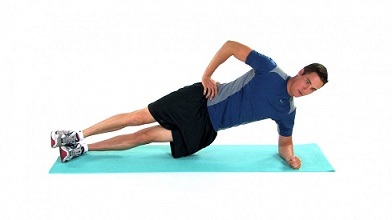 The last exercise that I do is a side plank with is up on the elbow on your side like this picture. I hold this one for 30 seconds. So these are the exercises that I do each morning before work. I have found out with the ball exercises that you do not notice an increase in strength but you will notice your balance getting better. As always if a certain exercises is sore you can continue to do it, but if you have an exercise which "ouch" hurt you must stop immediately.